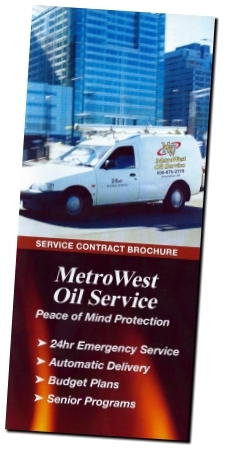 MetroWest Oil Service offers annual heating system service contracts to meet your needs and your budget. Our certified burner technicians are on duty or on call 24 hours a day, 365 days a year to provide peace of mind protection. Burner Cleaning & Tune-Up - Our "PLAN A", includes one cleaning and tune-up per year including parts and labor as listed on policy. Standard Policy - Our "PLAN B" which includes annual tune-up / cleaning and in addition there would be no labor charge for the repair or replacement of parts listed in the policy agreeement when needed due to normal wear and use. Deluxe Policy - Our "PLAN C" which includes annual tune-up / cleaning, all coverage listed in "Standard Policy" and in addition there would be no labor or materials charge for the repair or replacement of parts listed in the policy agreeement when needed due to normal wear and use.